Have genetically engineered herbicide-resistant crops increased or decreased herbicide use? It’s a simple question. And at first glance it seems like there should be a simple answer to this simple question. We have planted millions of acres of genetically-engineered (GE) crops, a vast majority of which are resistant to herbicides. In the U.S., we’ve collected lots of herbicide sales and usage data, spanning the entire time period when GE herbicide-resistant crops went from non-existent to dominating the landscape. So we should be able to simply look at the herbicide data before and after GE crops were developed, and infer an answer. Right? The rapid and widespread adoption of this technology reflects the important economic and environmental benefits that farmers have derived from its use (equal to … a 225 million kg reduction in herbicide active ingredient use 1996–2012). How is it possible that two scientists could look at almost the same data, but come to such drastically different conclusions? How could the same simple question lead one person to conclude that herbicide use increased by 239 million kg, while another person concludes that herbicide use was reduced by 225 million kg? 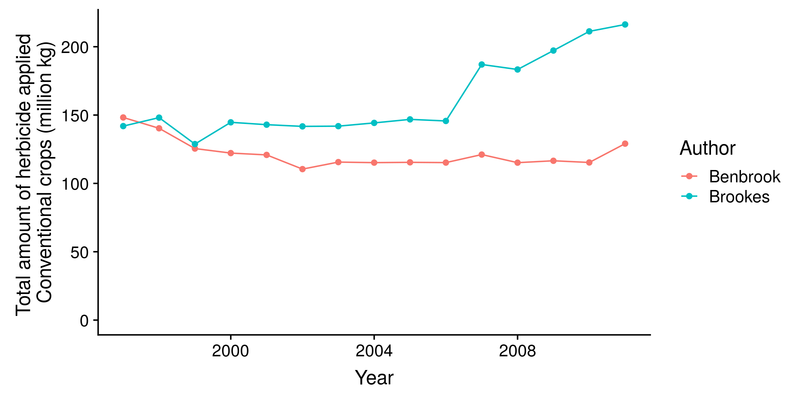 I wanted to take a look at this issue, so I pulled the data from both publications. 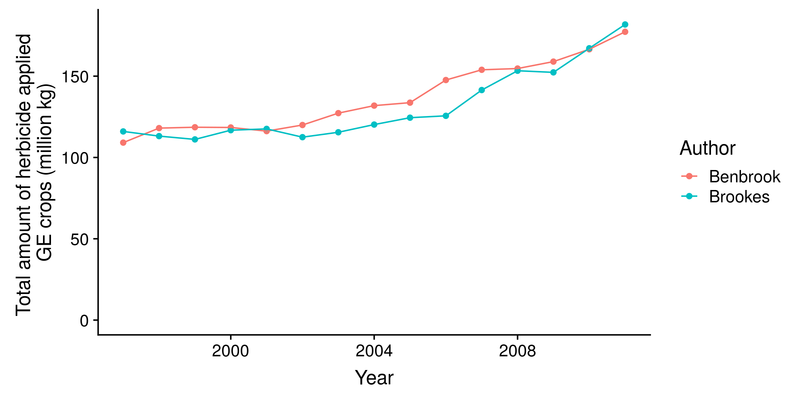 The first figure shows the estimated herbicide application rates per hectare as presented by both authors (I converted all units to kg/ha, and have only included the years from 1997 to 2011 so the comparisons aren’t biased by missing data). 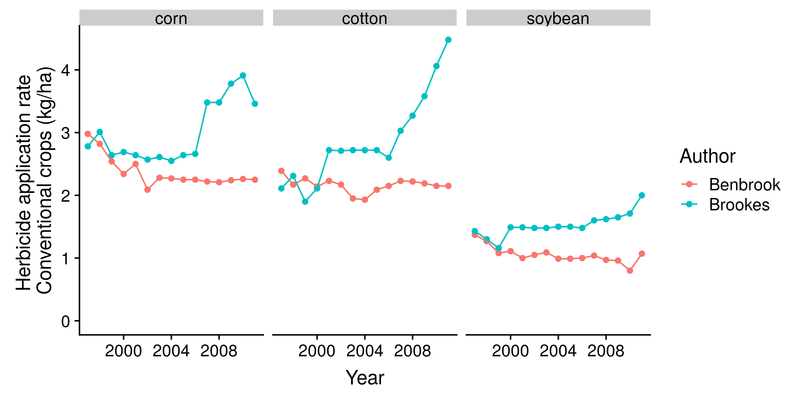 So with respect to total herbicide use applied to GE crops over the 15 year period between 1997 and 2011, Benbrook and Brookes come up with pretty similar estimates. The relatively small difference could be explained by differences in data sources used by the two authors (Benbrook relies on publicly available USDA-NASS data and had to interpolate some missing data, while Brookes uses proprietary data from GfK Kynetec that was presumably more complete). Most importantly, this difference in the estimated amount of herbicide applied to GE crops doesn’t come close to explaining the discrepancy of over 460 million kg (239 million kg increase from Benbrook compared to a 225 million kg decrease from Brookes). To get to those figures, Benbrook and Brookes also had to estimate herbicide use on conventional crops. And this is where things get interesting. The herbicide use estimates from both Benbrook’s and Brookes’s articles are based on imperfect data. And this is not the fault of either author; there just isn’t a very good data source to make the comparison we’d like to make. We want to know whether introduction of GE herbicide-resistant crops increased or decreased herbicide use. To really make this comparison, we’d need similar numbers of farmers adopting GE technology as those sticking with conventional technology, and then we could directly compare herbicide use for both groups. But this just didn’t happen, so there are some confounding factors that preclude making a direct comparison. Benbrook and Brookes handled this confounding factor differently. Brookes relies on data from industry sources – the data (from GfK Kynetec) is proprietary and not available for public scrutiny (which remains one of Benbrook’s primary criticisms of the Brookes analysis). But my guess is it is at least as accurate (quite likely more accurate) as the USDA data sources that Benbrook uses, and the similar estimates for GE crop herbicide use would support that. So although we can’t look at Brookes’s raw data, the GfK Kynetec data has at least one major advantage for comparing herbicide use in GE vs conventional soybean, in that it actually reports pesticide use separately by GE or conventional varieties. Benbrook’s UDSA data does not do this; USDA simply reports data on “soybean”, not on “Roundup Ready soybean” and “conventional soybean”. Benbrook admits in his paper that this is a problem: “NASS surveys do not report pesticide use on GE and conventional crop hectares separately.” So Benbrook approximates differences based on “other herbicides” in the USDA data. I’m not convinced Benbrook’s methods accurately approximate what soybean growers (or cotton or corn growers) would be doing if GE technology never existed. In my opinion, it is not reasonable to assume that the 10% of growers who did not adopt GE crops are representative of what the other 90% would be doing if GE technology never existed. In his paper, Brookes does a good job explaining this issue – he argues that the few growers not using GE technology today are not representative of all growers, and therefore their pesticide use reflected in the data is not an accurate way to estimate how the adoption of GE crops changed pesticide use. I tend to agree with this assessment, because one reason a farmer might not adopt Roundup Ready crops is because they don’t have major weed pressure to begin with. Or the farmer chose not to adopt GE crops because they are not dealing with weeds resistant to other herbicides already (like ALS or ACCase or PPO inhibitors). In these cases, pesticide use on those non-adopting farms would be lower even if they chose to use GE technology. The farmers most likely to adopt GE technology are the growers who had high weed pressure or weeds resistant to other herbicides. So comparing the 8% of conventional growers with the 92% of GE growers will almost certainly bias the herbicide use numbers against GE technology. Although Brookes describes the problem well, his chosen method for dealing with this confounding issue is also worthy of some skepticism. Brookes dealt with this issue by making assumptions on what farmers would be using today if GE crops never existed. I personally think Brookes’s methods are reasonable, but they are, in fact, estimates based on imperfect data – just like Benbrook’s. The Brookes paper is not technically saying total herbicide use has declined over time (the figures above disprove that assessment); Brookes is positing that total herbicide use is less now than it would be if GE technology were never used at all. So although Benbrook and Brookes mostly agree on herbicide use in GE crops, in order to make the desired comparison they are both forced to rely on models and assumptions to estimate herbicide use in conventional crops. And any time models and assumptions are used, there is potential for one’s own personal biases to creep in and affect the results. So what do these two authors have to say about herbicide use rates in conventional crops? Not a lot of agreement here. Benbrook consistently estimates that herbicide use rates in conventional crops would have decreased over time, while Brookes consistently estimates that herbicide use rates in conventional crops would have increased over time. So if we take these per hectare use rates, and again multiply them by the crop acreage for this period – we can now see how Benbrook and Brookes came to such dramatically different conclusions. Benbrook’s estimates suggest that herbicide use in conventional crops over this 15 year period was 1.83 billion kg, compared to Brookes estimates over the same period which imply use of of 2.42 billion kg – a difference of nearly 600 million kg of herbicide. So to summarize – Benbrook and Brookes provide similar estimates for herbicide use in GE crops (within 5% of each other). The massive changes these two authors attribute to GE crops is almost entirely derived from their conventional herbicide use estimates, which both authors had to rely heavily on models and assumptions to obtain. So, you may ask, which of these estimates is closer to the truth? Honestly – after all this – I’m not sure it matters. As I have written before, simply adding up the number of kg of herbicide applied isn’t useful. Herbicides vary widely in their toxicity, both to plants and other organisms including humans. So combining them all together and reporting a single number of pounds applied isn’t very meaningful. It would be akin to a doctor prescribing the same dose of medicine, regardless of the potency of the drug. It would be ridiculous to prescribe the same amount of Tylenol and morphine just because they’re both pain killers. A 500 mg dose of these two drugs would lead to very different outcomes. The same is true with herbicides. One pound of imazethapyr would have a dramatically different impact compared to one pound of acetochlor. I don’t think it is possible to say for sure what the impact of GE crops has been. 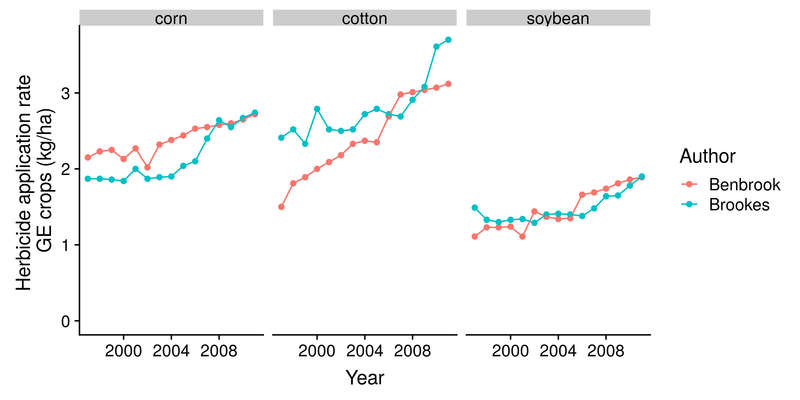 My personal opinion – based on the data I’ve analyzed – is that we’ve probably seen a net benefit with respect to both toxicity and the evolution of ‘superweeds.’ And one could even make an argument that adoption of GE crops has slowed the increase in herbicide use. But the one thing I am absolutely sure of – getting an answer to this question is anything but simple. Next Article How much dicamba is required to injure soybeans?